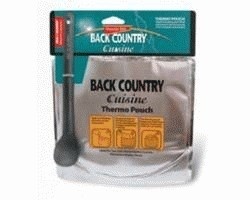 The Thermo Pouch is the perfect winter hiking companion to keep your Back Country meals piping hot. Place your meal pouch, prepared with hot water, inside the thermo pouch to ensure you retain maximum heat during the rehydration process and continue through to your very last bite. Comes with 1 x Sea to Summit Alphalight long handled spoon. Doubly effective thermal and reflective insulating properties. Durable metallised plastic outer material with open cell foam insulating core. Keeps hot food hot.